Ticketor FAQ: How to Sell Tickets Online! Ticketor FAQ: How to Sell Tickets Online!! • What will be the address of my ticketing page / website? When you sign up, you pick an address and the address will be www.Ticketor.com/[A name you choose]. The name you choose will most likely be your business name or brand. However, you can use the white-label feature and change the address of the site to your own domain (for example: www.MyWebsite.com) or sub-domain (for example: Tickets.MyWebsite.com). • I have purchased a domain name. Can I use it for my website? Sure. After sign-up, you will get the instruction on how to point your domain name to the website. • Can I integrate ticketing into my website? Sure you can. There are several integration methods and you can seamlessly integrate your Ticketor with your site. You can use Ticketor to add a ticketing section to any site or you can embed ticketing, as an iframe, in your pages. • Do I need a website to use with Ticketor? No, you can use your Ticketor-based site as the stand-alone ticketing and box-office site. • Can I sell other merchandise on Ticketor? (CDs, DVDs, T-Shirts, etc.)? Yes, Ticketor has a simple store-online that allows you to sell merchandise online. • Can I try the site for FREE? Yes, Simply sign up for the Standard plan and try it for yourself. You don't have to pay unless you actually start selling tickets and using the site. If you make a sale for test purpose, make sure to void the invoice right after to avoid being charged. • Is there a cancellation fee? • Do I have to enter a long term contract to build my website? No - You can cancel at any time. • Can I use this website to sell tickets for other organizers? Yes. 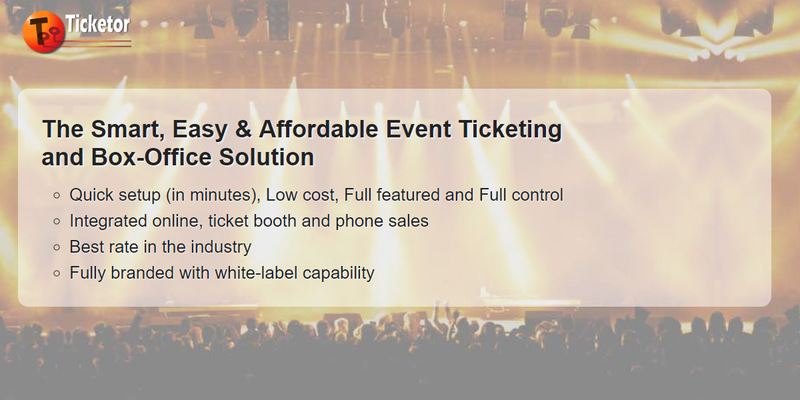 You can actually offer ticketing service to other event organizers. • Do I have to pay for the hosting? No. Hosting is free and covered. • Shall I use my personal email address or do I get business email addresses? We never expose your personal email address. Your Ticketor account comes with business email addresses as follows. All outgoing emails including welcome emails, sales confirmation and customer communication will be sent out from these emails. • How do I get help? Our goal is to make sure you are able to use every single feature of the site. Our admin support team will be happy to help you with any issues you may have. The site is designed in an intuitive manner. So you can simply start using it. We also have walk-throughs, step-by-step instructions and tutorial videos. We have the best customer support! You will be assigned a dedicated customer support engineer and you can chat with them or send them email at any time for free. Need more help? We can even arrange for a remote meeting. You can also use our assisted setup services for a small fee. It can help you by designing your seating chart or designing the website. Will-Call is a delivery method where customer purchases their ticket online and picks it up at a designated address or a booth at the venue. Usually will-call tickets are available for pick-up from a few hours before the event at a booth at the venue, however if you have an office, or a retail location, you can offer pick-ups at your location. • What is a general-admission event? A general-admission event is an event that a seat does not get assigned to the buyer during the purchase. It may be a seated event on a first-come-first-serve basis or it may be a standing event. Even though the event is not assigned seated, you can still have price levels and price variations. For example you may have different price levels for balcony or VIP area or you may offer child, senior or early-bird pricing. • What is an assigned-seat event? This is an event in which the customer is assigned a seat during the ticket purchase. Each ticket has a seat number on it. Different section, rows or tables may have different prices or you may offer different price variations for the same seat. For example senior or kid prices. • How many events or venues can I have? Can I sell tickets to multiple events at the same time? You can have as many events and venues and you can sell to as many events at the same time. • If the event is assigned seat, can the buyer pick their seat? • Can I ask additional questions from the buyer? Yes you can ask as many questions. • What payment methods are available to the buyers? Buyers can pay using any Visa, MasterCard, American Express or Discover card or pay using PayPal. • Can I sell tickets in cash or check? Yes, you as the admin and any sales agents that you introduce, can sell tickets in cash or check. • Is Ticketor also a POS (point of sales) system? Yes Ticketor can be used to sell tickets online as well as over-the-phone or face-to-face in the ticket booth or retail locations. • How much does the buyer pays in fees? It is totally up to you as you are the one who sets and collects all the fees that the buyer pays in service charges or delivery charges. One common practice is to set the fees in the amount to cover the ticketing and payment processor fees so you can get the full face price of the ticket. However you may decide to set the fees to a lower amount or zero to absorbe some of the fees, or set it to higher amount to make extra money or to add the fees to the ticket face price. Considering Ticketor's low fees, there is a big margin for you to make extra income just by setting the fees to what other ticketing services charge. Use the cost calculator on the pricing page, to calculate the exact amount to set the fees to to cover your ticketing fees. • Can customers return tickets on my website? Yes and only if allowed by your returns policy. The website has the feature to allow returns however you should specify for each event if you accept returns and until what time you accept returns. You can also specify how much fee you deduct from the returned tickets. The customer can select to return tickets for refund to their credit card or refund for "Store Credit" that can be used for further purchases. • Can I return tickets on my website? Yes, you as the admin will be able to make refunds for any purchase. You can return any ticket for any amount either as refund to original credit card or to store credit. • When do I get access to the sales money? The greatest advantage of Ticketor is that you collect the sales money directly through your own payment processor / PayPal. It means that you will have access to your money directly and as tickets sell (before the event). Depending on your bank and payment processor settings, the funds from each sale will be available in your account in few business days after each sale. • What delivery methods are supported? Your website can handle all popular delivery methods including will-call, e-ticket, digital tickets and different mail (post) providers. Direct delivery is also available for face-to-face sales. • How much is the charge for each delivery methods? You can determine and set the fees for each delivery method. • When do I know how many tickets are sold? You receive an email when there is a sale on your site. However, all our reports are real-time. Meaning that they show the most recent data at any time. You can pull the proper reports to check the status of your sales. • Can I get an email notification when a ticket is sold? Yes, anytime a ticket is sold, you will get an email with the sales details. • How can the website help me promote my events? Ticketor submits your site and events (except private events) to Google and other search engines on regular basis to make sure they are easily searchable and ranked high in the result. Your site and all the URLs are search engine friendly and help your event show up high in the search engine search results (Google, Yahoo, Bing, etc.). The website collects the email addresses of all your customers and allows you to send out news-letters to customers who are in your mailing list. Social Media and Facebook integration, allows you to leverage the power of social Media and Facebook to better promote your events. You can add text, pictures and video to the event page to describe the events. • How easy is it to setup a site? Setting up a site is very easy. Just fill out the sign up form and sign up. Your website will be immediately ready and you will be taken to the site to customize and design. You will be provided with walk-throughs, instructions and video tutorials. You should be able to set up everything and start selling in minutes. • Can I add/remove add-on features at any time? Yes, you can add/remove any add-on feature at any time. • How can I receive payments on the site? • What if I don't have a payment processor or merchant account? Any business that needs to charge credit cards, needs a payment processor. You can easily get a payment processor during the set up and start using it right away. A payment processor allows you to accept and charge credit cards. Any business that needs to charge credit cards need to have a payment processor. You may already have a payment processor if you accept credit cards in your business. Please note that personal or business bank accounts, are not able to process credit cards. So you need a payment processor to charge the credit cards and deposit the money to your bank account. If you don't have a payment processor, or your payment processor is not compatible or cannot be used for online transactions, you can simply get a payment processor in few minutes and use it right away. If you already have a merchant account that can process online transactions you can most probably use your own payment processor. If your payment processor is not in the list of supported payment processors below, you may still be able to use it. Most payment processors are compatible with Authorize.net gateway. Contact your payment processor and ask them to set up an Authorize.net gateway for you. However, remember that it may be cheaper and faster to get a new Stripe account instead. • What payment processors are supported? Braintree: Braintree offers service in a lot of countries around the world (US, Canada, Europe, Australia, ...) and in different currencies. Approval and set up may take a few days. They offer service at no monthly or setup fee. Authorize.net: Authorize.net is a gateway that works with most merchant accounts in the US and other countries. No matter where you get your merchant account from, you can ask them for an Authorize.net gateway. PayPal Advanced or Pro with PayFlow: You can sign up for a PayPal Advanced or Pro with PayFlow (US only). These accounts allow you to accept credit card on your own website. PayU (India:) Users located in India can use PayU as their payment processor. Please note that payment processors are not in any way related to Ticketor. The rates and information posted above, may have changed since this document was last updated. Always check with the provider site for latest updates. • I already accept credit card in my business. Can I use the same merchant account? If you already have a merchant account you should first make sure that they are set up to accept online transactions. If not you will have to get a new payment processor. • How much does a merchant account cost? Each payment processor may have different rates. Check the payment processor site for their fees. PayPal: is a service that allows you to accept credit cards on your website. During the checkout, users will be redirected to PayPal, to enter their credit card information. PayPal authorizes the charge and collects the money into your PayPal account which is transferable to your bank account or could be debited in different methods. It is very easy to obtain a standard PayPal account and it can be done online in few minutes. However, PayPal has some disadvantages. PayPal is not the most user-friendly payment method. User has to be redirected to PayPal to make the payment and PayPal decides on a case-by-case basis whether the customer can pay directly on PayPal using their card or they have to sign in for a PayPal account to make the payment. The decision is made based on PayPal risk management algorithms. Getting redirected to PayPal and having to create an account could be a hassle and confusing to some buyers. On the other side, PayPal gives extra security to the user as PayPal will not share the credit card information with the website owner or merchant (you) and hence an informed internet user may prefer to use this option for better security. PayPal offers service in many countries and currencies. So for some countries, PayPal may be the only available payment processor. Considering the pros and cons, and if you have the option to get a payment processor, it is recommended to have PayPal as a secondary method of payment. If you integrate both a payment processor and a PayPal account, the buyer gets the option to choose one on the checkout page. • How much is the cost of using PayPal? • How can I sign up for PayPal? You can sign up for PayPal for free and just a few minutes. Just go to https://www.paypal.com and sign up for a free Standard Business account. • How often do I get a bill? You usually get billed on a monthly basis on the same day of the month when your account was originally set up. However, the system may ask you to make partial payments in the middle of the billing cycle, but anyway, you will only pay for the sales that have already occurred on your website and you have already collected the money. • Where can I see my bill? You can login to your website as admin to view your current and past statements. We don't offer paper bills. • How can I pay my bills? You can pay using any credit card or PayPal account. You need to have a credit card or PayPal account connected to your account and accept to auto-pay the bills using that payment method. If your credit card expires or does not go through, you will get an email to enter a different credit card. • How can I cancel my account? You can simply cancel your account anytime from your control panel. No- You can cancel at any time. • Who is going to add tickets to my website? You are responsible to add tickets to your website. Instructions, tutorials and walk-throughs are available as well as great customer support. • Who is going to setup my venue and the seating chart? You are responsible to create and setup the seating chart using the seating chart designer. Instructions, tutorials and walk-throughs are available as well as great customer support. Optionally, you can also order your seating chart to be designed at a small fee. • Is my venue and seating chart supported? Our system is compatible with almost any venues and seating structure. You can design the interactive seating chart pretty close to the original seating chart. It is compatible with amphi-theatre style seating charts, round-table seating charts, night-club style tables, general admission venues and any combination. • What if my event doesn't have a seating chart (like a standing events or a general admission event)? It doesn't matter. You can sell general admission tickets on your website. • What if my event does have a seating chart? You can allow your customers to pick their seat on the interactive seating chart or they can ask the system to find them best available seats for their price range. • What if my event is cancelled? Events may cancel for different reasons. What you do in case of the event is cancellation is up to you and your business strategies. Ticketor does not force you into taking any action however we provide the tools for you to properly inform the buyers of the cancellation and to refund the tickets. Ticketor refunds your fee, when you refund a ticket. Your website can handle all popular delivery methods including will-call, e-ticket (print at home or show on the phone) and different mail (post) providers. Direct delivery is also available for face-to-face sales. You can decide what methods to offer for each event and how much to charge for each delivery method. • Who is in-charge and responsible for ticket delivery and validation? You are the one who is responsible for ticket delivery and validation. • What is an e-Ticket / Digital Ticket? E-ticket is the easiest, most automated and most popular delivery method. As soon as the buyer purchases the tickets, they can print the tickets out or they can show them on their phone. They also receive a confirmation email with a link to their tickets. They can also access their e-tickets by logging in to their account. e-Tickets are secured using a hard-to-generate code that is printed on each e-ticket. It is printed in QR code format, barcode format and human readable digits. At the gate, tickets should be validated to make sure they are valid and they are not duplicate (not being used more than once). All you have to do, is to validate those tickets at the gate using our free Android, IOS or web app or a professional barcode scanner. Check out our blog on Gate Control & e-Ticket Validation for more information. • What does an e-ticket look like? Here is a sample on an e-Ticket printed with Ticketor. You can customize the look and color. It will be printed with your name and logo (not Ticketor's). Each ticket will have a barcode and QR code for security and validation. • How can I validate e-Tickets? The purpose of gate control is to validate tickets at the gate and admit valid tickets to your event while distinguishing and rejecting all invalid and duplicate tickets. Invalid Tickets: Tickets that are generated fraudulently or belong to another event or another performance of this event or they are refunded. 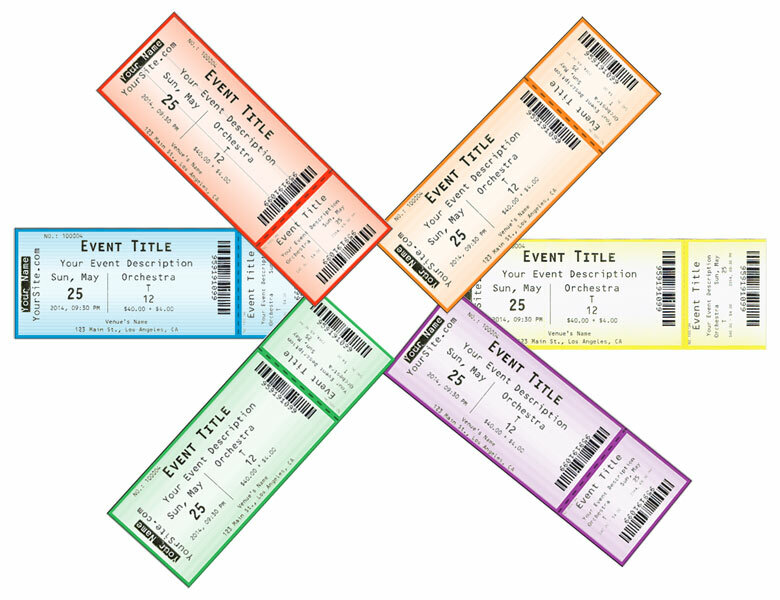 Duplicate Tickets: Tickets that are printed or copied more than once and are being used to admit more than one person to the event. You can simply scan the tickets using Ticketor's free Android or IOS app or using any device with a browser. Optionally you can use a professional barcode scanner. When you scan each ticket, the app validates the ticket and shows a message indicating whether the ticket is valid, invalid or duplicate. • What if somebody prints multiple copy of an e-Ticket? You will catch the duplicate tickets while validating the tickets. Only the first copy of the ticket is accepted. The customer is responsible to protect their ticket and not copy it. • How can I get a compatible barcode scanner? For small to medium events, you can use your phone for scanning and validation. For bigger events you may need physical scanners. Checkout compatible devices at Ticketor Store. • If somebody returns a ticket, what happens to the e-Ticket he has already printed? It will be automatically voided and not accepted by the barcode scanner or the admission list. • How should I deliver will-call tickets? 1- Print all will-call tickets in alphabetical order and take them to the door for delivery. 2- Print will-call tickets per transaction as the buyer shows up to pick up their tickets. • What printers can I use to print tickets (will-call, mail or for face-to-face sales)? 1- You can use a regular inkjet/laser printer with regular paper to print tickets that look like e-tickets. 2- You can use a compatible thermal ticket printer to print professional tickets. Checkout compatible devices at Ticketor Store. • What mail options shall I offer on the website? You necessarily don't have to offer mail options. Most of the customers prefer e-tickets and the rest can use will-call. If you want to offer mail, you can contact different mail providers (USPS, UPS, FedEx, etc.) to find the best option for your needs and the related cost. You should also ask about the delivery time and make sure to stop the mail delivery option a few days before the event to accommodate enough time for the shipping. • What if a ticket gets lost in mail? You can void the tickets and re-issue new tickets with a new barcodes. • Do I still need to print traditional (hard-copy) tickets for my event? Since you are selling tickets online, you probably don't need traditional physical printed tickets. Most people will buy online and either print their tickets at home or just show them on their phone. Also Ticketor is a box-office solution meaning that you can use a computer/table to sell tickets face-to-face or over-the-phone in your ticket booth or as many retail locations. However, if you need physical tickets, using Ticketor, you can print physical (hard) tickets with barcodes that are compatible with the e-tickets and can be scanned using the same scanning process. You can either purchase a thermal ticket printer and ticket stocks from Ticketor's store and print hard tickets by yourself or order tickets so we print and ship to you. You can print in up to 6 colors. • How much can I customize the design of my website? Your website comes with a designer tool which allows you to easily design the site to your perfection. You can pick a theme (colors), upload logo, background-image, header, email headers, email footers, logo for e-tickets and more. Advanced users and designers can also use CSS to have more control on the design. • Can I match the feel and look of the Ticketor website with my existing website? Yes, you can usually get to a design which is very similar to your existing website. • Can I add CSS to my website? Yes, you can use CSS to design your website and have full control over the design. • Can I have free form content pages? Yes, You can have content pages that you can edit using a rich text editor and add pictures or videos. • Can I have a photo/album page? Yes, You can create as many photo and video galleries. • Can I have a page for news or blog? Yes, you can create as many blog/news pages. • Can I have my videos on the site? You can create as many photo and video galleries. • Can my users login with Facebook? • Can I sell on my Facebook page? • How does Social Media and Facebook integration help my business? By adding "Social Media and Facebook" feature, your website will get integrated with Facebook and Social Media to leverage the power of them to reach to more customers. • Can I monitor / analyze my sites traffic? Yes, add the "Google Analytics" and you can get detailed analytics for your website including the traffic volume, source of traffic, visitors demographic and their behavior and much more. • Do I have access to my customers' information? Yes, you will have access to each customer information and contacts. • Can I send out email/news-letter to my mailing list? Yes, you can create email templates and send out emails and news-letter to you customers. • Can I send out emails to people who purchased tickets to a specific event? Yes, you can send email to anybody who purchased tickets to a specific event. • Is my website secured (SSL)? Yes Ticketor is PCI (payment card industry) compliant and all transactions are handled securely. Yes. If you want to sell tickets for other organizers, the website offers everything you need.